Created by RADOX in February 2016, this web site was designed using the latest web practices to be easily updateable by the client themselves. This web site was created by RADOX in February 2013. It was designed to be easy to view and use by older computer users. RADOX provided its services free of charge. 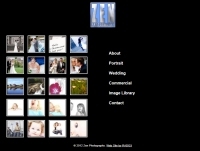 RADOX was contacted by Zen Photography in February 2010 to update their existing web site and make it more visible to internet search engines. With them we developed a Photo Studio web site solution. The web site is initially setup and tailored to the customer's exact requirements by RADOX. The customer then used a secure, easy-to-use custom admin section to manage the web site's content themselves on an on-going basis. RADOX took over the maintenance of the Tadcaster Community Swimming Pool web site in January 2010. 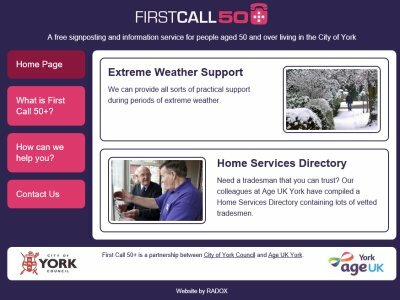 The web site was completely re-designed to make it much easier for users to navigate and find the information they were looking for, as well as being much easier to maintain and keep up-to-date. "RADOX have transformed our website from basic home page to numerous pages and online payments. I have found RADOX to be extremely professional and knowledgeable and would recommend them to anybody." 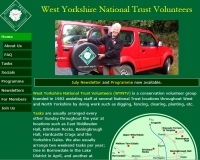 RADOX began helping to maintain the West Yorkshire National Trust Volunteers web site in August 2008 and took over this role in 2009. A complete appraisal and re-design of the site was performed making it both easier to navigate and easier to maintain. The web site has evolved over time to become the focal point of the group's administration. A bespoke admin system holds the group's membership database securely online and makes communication with members via email a breeze. "The site is easier to navigate now, and the feedback I have received has been uniformly positive." 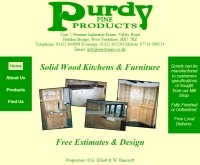 Purdy Pine Product's web site was created in a matter of days from just a few items of existing printed literature and photographs. RADOX created this web site in February 2008. RADOX took over the maintenance of the RDD Online web site in August 2006. This is one of the largest and most sophisticated sites worked on by RADOX to date with it's extensive use of PHP server-side scripting, MySQL database driven content, Online purchasing, automated background tasks and user access control. This site demonstrates our ability to serve clients both near and far. "RADOX has provided RDD Online with a professional and state of the art e-commerce website and conference management system at an affordable price. They continue to optimize our site and provide a 'one stop shop' for all our web related issues. RADOX is very responsive to our needs and has always provided insightful ideas - all working 'virtually'. The attention to detail is greatly appreciated and their on-going service has been impeccable. I have absolutely no reservation in recommending them." 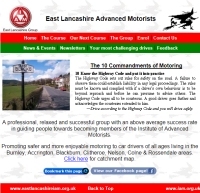 The East Lancashire Advanced Motorists web site was designed entirely by RADOX in April 2000 and continues to be maintained to this day. Consisting of multiple pages, including some automated, self-updating pages, this site also includes web-based Contact Us and Feedback forms generating email responses. As this customer is a non-profit making organisation, RADOX agreed to provide their services free-of-charge. "We have utilised the services of RADOX for the last ten years. They are only too pleased to make changes to our site which they have maintained, free of charge during this time for us. We have no hesitation in recommending RADOX's work or commitment to anyone." This web site was designed by RADOX in February 1998 and continues to be developed and maintained to this day. This site has evolved over time to maintain a fresh appearance and has included, amongst other things, a custom-designed discussion forum, user comment support and social network integration.